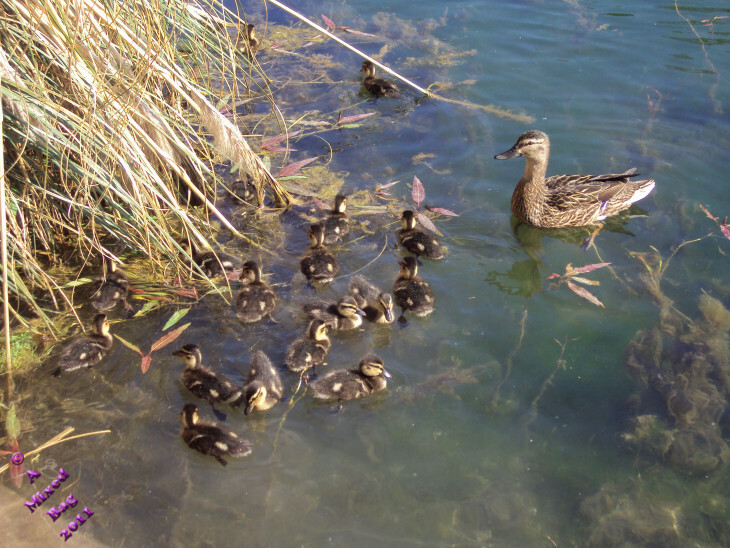 Mother sounds stressed, but I know if I paddle any faster, I’ll end up face first in the water. It’s all I have to just keep upright and moving forward. I honestly don’t know why I ended up with the clumsy gene. At least I’m not the ugly one. I’ve been concentrating so hard, I don’t realize how far away they all are. “Mama,” I squeak loudly, hoping she will hear the fear in my voice and rush back for me. I know she’s always telling us we need to learn independence, but I’m too clumsy. I’m not big enough and I just can’t do it on my own! Why can’t she understand that? “Mama!” I squeak louder this time because she’s so far away, I’m not sure she even heard the first one. I can feel my beak slipping in and out of the water and I know I’m starting to lose it. Just a few more waddles and I’ll be completely helpless. Just when I think all is lost, she’s there, pushing me toward the others. I’m never going to live this down, but at least my head’s still above water. The rules for Sunday Photo Fiction are to write around 200 words in either poetry or story form based on the photo prompt. I also chose to combine Just Jot It January where today’s prompt, clumsy, was suggested by Judy at Edwina’s Episodes. Click on the blue froggy to read other amazing Sunday Photo Fiction. Sometimes years can go by without hearing a song, but then it comes on the radio or you hear it at a friend’s house and it’s like coming home. I also think the lyrics are rather fitting with the new baby in my life and the realization that time flies by so fast. There’s no way to hold on to it, so the best thing we can do is enjoy ever single moment to it’s fullest. I watched the video, and I’m not going to lie… it made me cry. 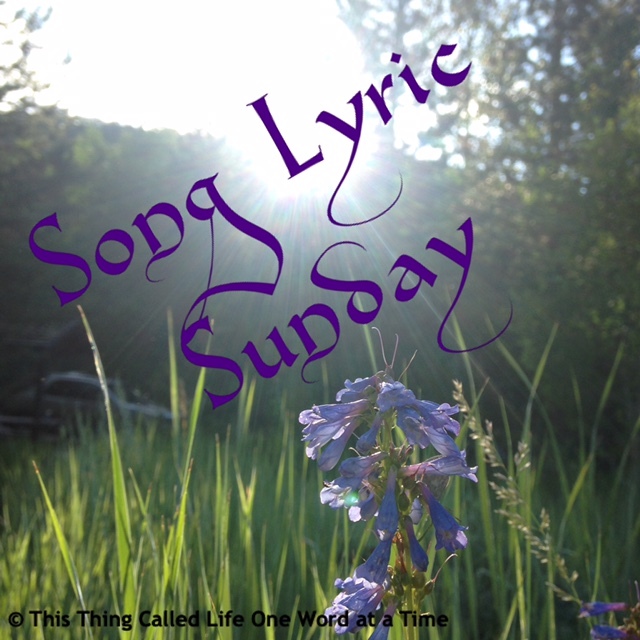 I hope you enjoy this week’s Song Lyric Sunday. Feel free to read the “rules” below and join in with one of your own. I spent the afternoon with my sisters. I pretty much invited myself, but I couldn’t help it. 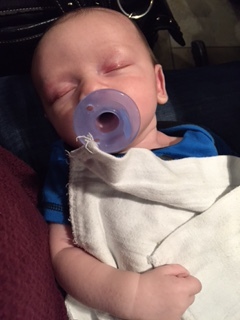 I had to get my baby fix in because it had been over two weeks. I also missed my siblings. Their choice of lunch was sushi, of all things, but it didn’t even matter. 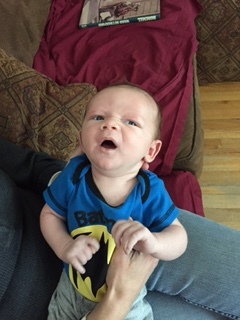 My sister made the comment that it’s pretty amazing how women can spend hours just sitting and staring at a baby and laughing at his faces and little baby squeals. Literally, the entire afternoon just melted away in Brody’s sweet baby face. It was also pretty amazing to get some girl time in, just talking and laughing about not much of anything. We did discuss getting tattoos together, which is totally happening sometime this year. I’m not sure we have a solid plan yet, but it will all come together. 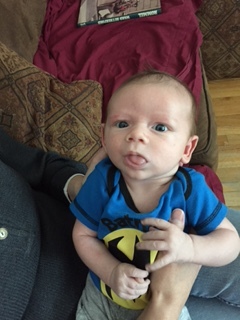 I feel like my blog has been flooded with baby, but I can’t even help it. I have to share his too sweet face with the world. I hope you all had an amazing Saturday! 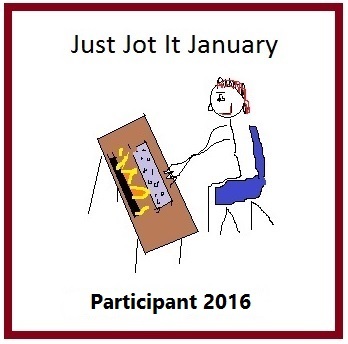 Just Jot It January and SoCS are both hosted by Linda G. Hill. Today’s prompt was “an”. I’m not even sure I used it in my post, but it made it into the title, at least. My serendipity just about ran out today. I called the insurance company to finish the claim on Jaxon’s phone and they are way smarter than I gave them credit for. They told me the phone wasn’t covered when it was lost, which is actually true. If I could have kicked myself I would have. After the fact, it was easy to realize I should have used some mendaciloquence when I told them what happened to the phone. But, my first instinct is truth, and that’s what I told them. I was back to square one – freaking out and wondering what the hell I was going to do. I finally decided to call the ski resort, just in case. I described the phone and left my number. The person I talked to said they didn’t have it but she would call if it turned up. The plan was to call my carrier after work to see what my options were. About an hour later, I received a phone call… and they had his phone! I had to take a pretty scary drive up the mountain in the snow and rain, but his phone is home, safe and sound and it actually still works! 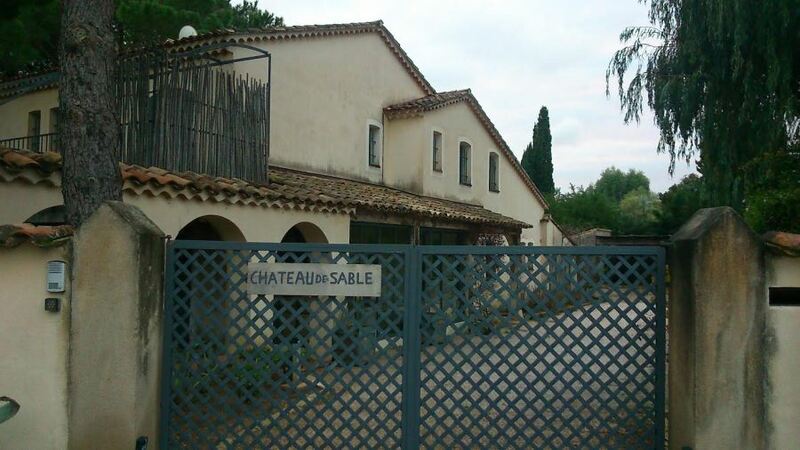 Looking out the window at the expanse of her chateau was a mixed blessing. She still enjoyed the heart-wrenching view, but she no longer saw flowers in rainbow colors or trees and hills in vibrant green hues. The colors were gone now, replaced with shades of gray. One of these days, she would venture through the walls; but for now, she remained by the window in her bedroom. But every now and then, if a door was left open, she would venture through the halls and remember what it was like to live and love before it was all taken away. Friday Fictioneers is a weekly flash fiction prompt where we are given a photo and asked to write a 100 word story – beginning, middle and end. This one is 101 words. I also combined Just Jot It January hosted by Linda G. Hill. Today’s prompt, ghost, was suggested by Barbara at teleportingweena. For some reason, I have always equated serendipity with love. Maybe it’s because I saw a movie with that title (or something close to it) when I was younger and it was a love story. I’ve come to realize the word doesn’t necessarily have anything to do with love. I received a phone call from my son last night letting me know he lost his phone while snow boarding. And it’s not like he left it on the bus or lost it in the lodge or on the lift. No, he had it in his coat pocket that he forgot to zip up when he went down the slopes. I’m pretty sure that phone is buried in ten feet of snow next to some nice trees and they just might find it sometime around June, if ever. I just got Jaxon a new phone in October. It happens to be a new iPhone 6S with 64 GB. His first question was, “Is there insurance on it?” And of course, my sickness deepened because I declined the insurance, not wanting to pay an extra $11 a month. I was upset last night, to say the least. I knew I couldn’t buy him a new phone. I didn’t know how to activate his old phone on my account without messing everything up. Needless to say, I had a very restless night. I was going to call my cell phone carrier first thing this morning, but as it happens, I was so busy, I couldn’t do it until lunch. Right before I went to lunch, I logged onto my account and checked to see if they were running any specials to add insurance on his phone, and wonders never cease, I was able to add it! I decided to wait and call them on my way home, and sure enough, they verified that his phone had insurance and they gave me the claims number. I called and tried to process the claim tonight, but according to them, they need another 24 hours for processing. So, I’m hoping the events will continue to be serendipitous and my son will have a new phone on Saturday. He did have to fork out some of his summer earnings to help pay for the deductible, but it’s a whole hell of a lot better than paying for a new phone! Just Jot It January is hosted by Linda G. Hill. Today’s prompt, serendipity, was suggested by Jan at JT Twissel. We all lie. I know there’s some of you out there who are shaking your head and believe me, I’m one of you. It’s hard for me to admit that I lie, but we all do it every single day. Sure, it’s usually in small, insignificant ways. I hardly doubt most of you do it in a mendaciloquent way (which is just a very big word that means “to speak in a deceitful, but artful and convincing way”… according to the Urban dictionary). I’ve had this argument with the boyfriend before. I flat out told him I never lie and he basically told me what I just said to all of you at the beginning of this post. I’ve always thought of myself as honest, probably to a fault, and I’m not sorry about it. But after our little “argument” I started noticing the little things I did, and sure enough, you could categorize them as lying. The boyfriend said “lying” is too strong of a word for it, but that’s basically what it is. I believe honesty is always the best policy. But what if your honesty hurts someone? Do you still tell the truth? I think I’ve learned that maybe the blunt, brutal truth isn’t always the best policy. There are ways to soften things so it doesn’t hurt quite as much. But that almost sounds a bit mendaciloquent – or maybe I don’t necessarily understand the meaning of the word. Again, I’ve always told my kids that I will answer any question they ask me. There have been times when I’ve asked them a question back… are you sure you want to know? Jaxon told me once, “never mind, I don’t want to know”. But Adelle, she’s like me. She wanted to know despite my caution and I think she was sorry afterwards. That might have been one of those times I didn’t need to be quite as honest as I was… maybe some mendaciloquent answers would have worked just fine. Just Jot It January is hosted by Linda G. Hill. Today’s rather cumbersome but slightly enjoyable word was suggested to us by Coralee at Musefully Mendaciloquent.